The Yoshino cherry blossoms are in full bloom right now, and it will be prime viewing through at least the weekend. UPDATE: The NPS has announced that we reached peak bloom today, March 25. It's not the prettiest morning we've had weather-wise, but the cherry blossoms are looking spectacular. They're in full bloom now, and it's shaping up for a wonderful weekend for cherry blossom viewing. The Tidal Basin isn't as crowded as yesterday, at least so far. The weather forecast probably kept some people away, but the rain never turned up. There are plenty of clouds, though, and a bit of a breeze. While it is possible to find some petals on the ground, it's only a tiny, tiny amount for now and in no way diminishes how the trees look. The one exception is the indicator tree, which is well on its way out and has lost a majority of its petals. For the people who have asked about the Floral Library and the progress of the Kwanzans, see the sections towards the bottom of this post. It's going to be a spectacular Easter weekend for the cherry blossoms. They're in their prime, and the weather is looking fabulous. It's going to be very busy. But to help keep it more fun than frustration, here are some logistical tips. Count on heavy traffic anywhere near the Tidal Basin and a lot of competition for parking spots. If you can, just about any option other than driving is better. Metro is a good choice, and the closest stations are Smithsonian and L'Enfant Plaza. Stations open at 7am on weekends. Here are some other alternatives for getting there. Other food options are a bit further afield. If you want something different and a very local experience, I'd recommend a short walk over to the Maine Avenue Fish Market, where you can get freshly cooked seafood and steamed crabs. There aren't many areas there to sit and eat it, especially with the massive construction site next door, but it's a very local DC experience. If you're looking for more of a sit-down meal, options on the National Mall itself are mostly limited to the Smithsonian museum cafes or the restaurants/cafes in the National Gallery. The Pavilion Cafe in the Sculpture Garden is a particularly nice setting. Other options around the Mall are mostly limited to some food trucks that have snacks and things like hot dogs and pretzels. But once you get to the opposite side of the Mall there are many, many options stretching from Foggy Bottom all the way up to Union Station. That stretch includes a huge number and variety, from the usual quick and cheap takeout options to some of DC's best high-end restaurants. For recommendations, start with the Washington Post Food Guide. You can find restrooms at the Jefferson Memorial, MLK Memorial, and FDR Memorial. There are portajohns in the parking lot next to the paddle boats and about a dozen out the back of the Jefferson Memorial. The emergency telephone number in the US is 911. There's a medical tent in the parking lot near the paddle boats. Or grab the nearest police officer or NPS ranger. The cherry blossoms are, in general, very kid-friendly. But having two toddlers myself, I know that there are some extra things to factor in so that the whole family enjoys it more. Railings: With young yet mobile kids, something to keep a close eye on is that there's no railing most of the way around the Tidal Basin. And the section where there is a railing isn't at all toddler-proof. I've never seen anyone actually fall in, but I have seen strollers that have gone over and had to be abandoned. 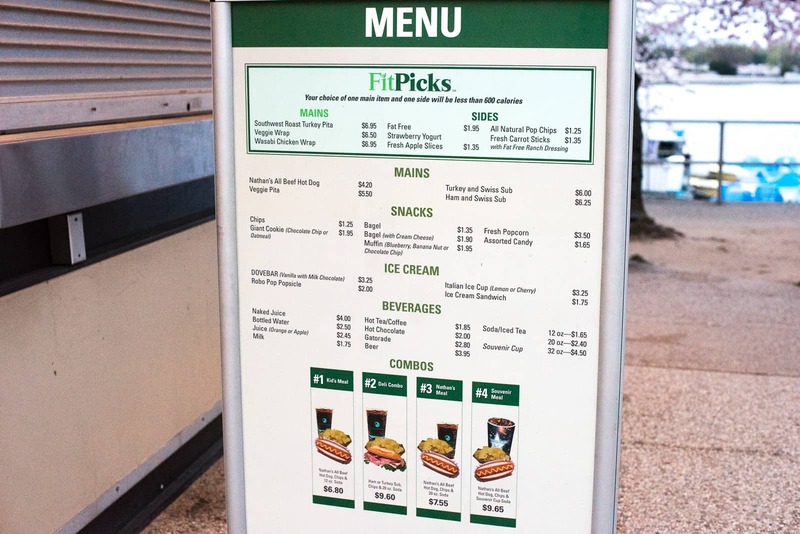 Food: Most parents become pretty used to packing some snacks just in case, but there are some basic snack and food options around the Tidal Basin. See the section above under Food & Drinks for menus so you can see if there's something that will satisfy fussy easters. If you're over by the FDR Memorial or MLK Memorial, it's a bit of a walk to the food options. Paddle Boats: The paddle boat operators do keep life jackets for kids on hand that go down to quite small sizes. Kids are welcome in the boats--there are 2 and 4 person versions--but someone in the boat has to be at least 16 years old. You can find more about the paddle boats here. Burning Energy: Just back from the Tidal Basin, especially behind the FDR and MLK Memorials, are huge open spaces that they can safely run around in to burn off some energy. One thing to watch is that a some of the fields are favorites with large flocks of geese and can get covered in geese poop. But there are others nearby that are fine. Crowds: It'll be crowded. A good tip from the NPS Police is to take photos of your kids as soon as you arrive. That way, if they do happen to wander off in the crowd, you have the ideal reference photo with the right clothes etc that they can distribute to track him or her down as quickly as possible. Strollers: There's no problem using strollers, with the understanding that the walkway will be very crowded and you'll be dodging people and tripods. Spotting Wildlife, Helicopters, and Planes: If your kids happen to be spotters--or have just had enough looking at trees---they'll almost certainly see ducks, squirrels, and starlings. They might see geese flying overhead in formation. I have seen bald eagles down there, although not often. They might see the occasional fish jumping (or splashing). Also the Tidal Basin is used as a flight path for military helicopters--they come in very low and loud, which our kids find very exciting. If you're really lucky, you might even see three, heavy Marine Corps helicopters flying in formation to drop the President off at the White House or take him to Joint Base Andrews (formerly Andrews Air Force Base). One of them is Marine One (when the President is on board), but three identical helicopters fly in the formation so that no-one knows for sure which one he's actually in. The two decoys peel off once they get right near the White House. Gift Shops: If your kids are getting cherry blossomed out and getting something to play with or color in will help, there are gift/book shops next to the MLK Memorial, at the FDR Memorial, and under the Jefferson Memorial. 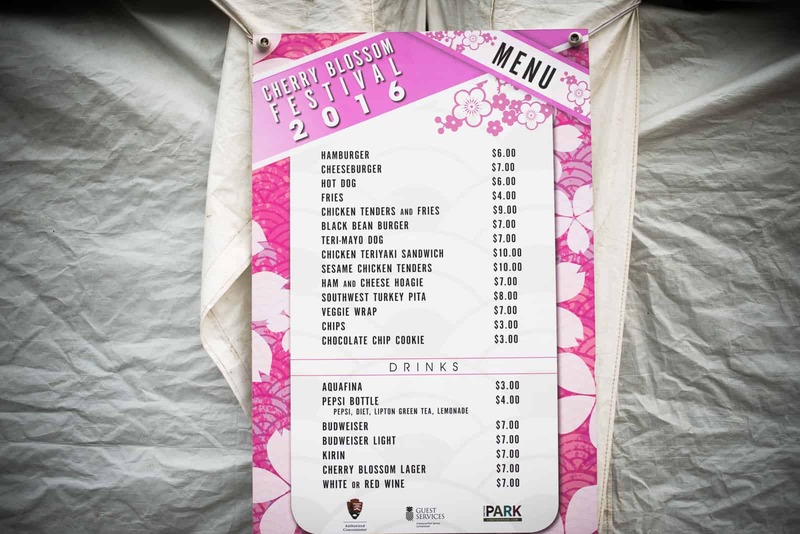 There's also a couple of dedicated cherry blossom gift-shop tents in the parking lot next to the paddle boats. All of them have books geared toward kids, coloring books, as well as other odds and ends. Protecting the Trees: Every year I see parents encouraging their kids to climb the trees to get a fun family photo. Please don't. Aside from the safety issues, many of the trees that are most inviting to climb are over a century old and easily damaged. Tulips are blooming in the Floral Library. There's maybe around half of them out, so it's looking wonderful now, but there are still plenty more to come. Apologies for the quality of the photos--it was still dark and overcast when I was there this morning before sunrise. The Kwanzan cherry blossoms typically bloom around 15 days after the Yoshinos. The last peak bloom forecast I heard for them was for around April 8, which seems about right now that the Yoshinos are in full bloom. Here are some shots of how they're looking this morning. I'll aim to check in on them from time to time (and post photos) in the coming weeks until they bloom. And I have more information on the Kwanzans, including how to find them. Previous « Does Rain (or Storms) Affect the Cherry Blossoms? Thank you so much for this blog!! It is very helpful!! I like the shots of the floral library. Do you think I'll be able to find more of them at the Netherlands Carillion in Arlington? My guess is yes they'll probably be on much the same schedule, but I haven't been by lately to check. Hello there! I'm coming from brazil and getting to d.c. on april, 4th. Do you think I'll be able to see all this beauty when get there or will it all be gone? The main ones, the Yoshinos, will be mostly or all gone by then, but you might catch the beginning of the Kwanzans. There's more about them in the post above. If we plan on going tomorrow morning around sunrise how early would you suggest getting there to get a parking spot? We are trying to decide whether to take a short 10 min. cab ride or try and drive. Any suggestions on how early to get there to find parking around sunrise? We were thinking 6:15am but is that too late? Hard to say exactly, but on Thursday morning spots were getting hard to find by 6:30. I'd expect a lot more people there for the sunrise tomorrow. I am going to be there 4/9-10 weekend. Would I be able to see the Kwanzans in full bloom by then? Also to see the fireworks, where is the good place to be and do you have any tips for me? You should see the Kwanzans then--and they might be in their prime right around then if the forecasts are right--but as with everything about cherry blossom schedules, it's really impossible to say with 100 percent certainty. The fireworks are along the Southwest Waterfront, which runs along the island that the Jefferson Memorial is on. There's a very long, open stretch along the waterfront there that is great for viewing. The fireworks aren't actually set from the Tidal Basin, but you should have no trouble seeing them from much of the area between the FDR Memorial, MLK Memorial, and the paddle boats.